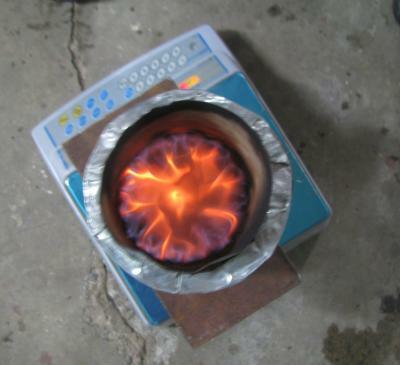 Roger Samson was here tonight and we made and tested a Grasifier: a Switchgrass burning stove based on the dimensions of the Vesto adapted to make a lower cost pellet burning stove for Haiti. The flame went completely blue (just before the end) then wobbled a lot and went out. When it went out there was no smoke indicating there were no volatiles left. Time to fabricate, about 30 minutes. I see this as a burner that can be attached to the centre of a Haitian charcoal stove to convert it into very clean burning a pellet stove. Char yield: 25% of the initial dry mass.